this past weekend brought out the summer weather (finally) and although it was ridiculously hot.... i was happy. i pretty much begged anyone who would listen to go somewhere with me to water and play in it. i suggested the beach. i suggested the river. i really wanted to rent something and play around in the river all day. BUT NO ONE WANTED TO GO! blake was like "nah." NAH? are you flipping kidding me?!?!?! he's just lazy and doesn't want to do anything that requires leaving the coach and the television. so i bought a slip and slide. you heard me. and it was awesome. and fun. but holy crap does it hurt when you land! 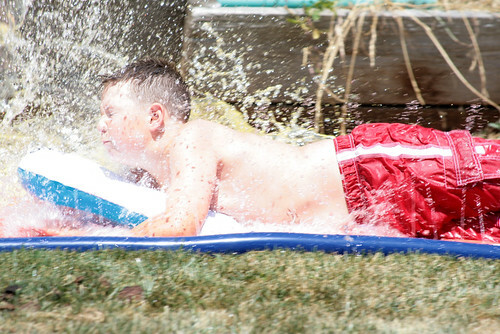 slip and slides are not made for big people. i also got understanding exposure- the book i've wanted for over a year now. 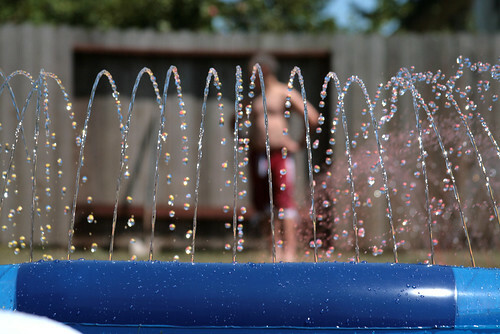 so i became obsessed with taking water movement pictures and "freezing" the movement. 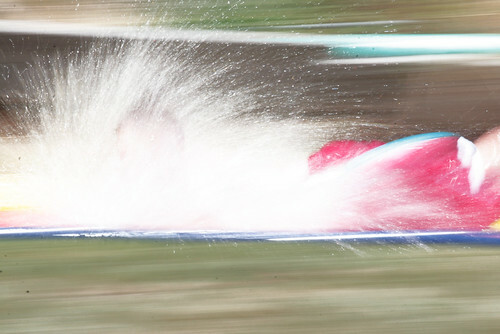 and also how you get the water to look softer like cotton candy, but i can't do that very well (at all). i will admit that when i read this book, it's still overwhelming and hard to know just what the hell everything is. i think you have to actually grab your camera and DO what the guy is talking about. it's the only way it all makes sense. i cannot believe i have shot my camera on P for this long. i now have it on M and it will stay that way forever (you know, now that i know how to set the exposure correctly). anyway, i kept making blake run and jump and do things in the water so i could take pictures of it. he's all too happy to be my guinea pig. yay. anyway, after slipping and sliding our friend was like "i have a boat you know." I'M SORRY, WHAT?!?! A WHAT?!?! hi, this is useful information. so yeah. fucker had a boat this whole time while i'm crying and begging people to take me somewhere with water and he's like... "well i have a boat. i haven't seen it in a year, it might be in bad condition.. and it might not start and.. " blah blah whatever.. all i heard was I HAVE A BOAT. so we got that sucker out and it was fine and it worked and did you know that boats totally have radios on them?!?! shutup. i didn't realize and it made it that much more fun to be blaring music from the middle of the lake. we spent all day sunday on the lake on THE BOAT. the boat that will now become my best friend. the boat that i have decided i will spend my summer on. i hope the boat doesn't mind. i didn't bring my camera on the boat, but i did bring it in my backyard! Those are awesome shots! I'm glad you were able to lure your model outside with a slip-n-slide. Um, I didn't mean that to be as creepy as it sounded. When we visited my dad last year in Arizona, we took his boat out on Lake Mojave and he had satellite radio. He played the 80s/90s station for us and I totally thought of you when NKOTB came on. :) Yay! Wow - you got some great shots! You've totally impressed me with your mad crazy photography skillz! WOW, I love these pictures!! I have got to get a really good camera and more importantly learn how to use it before the baby comes! Do you recommend any camera? Books for learning? Stuff that I should buy?? I want to get as good as you can Becky!! You and Becky, not you can Becky, which is just a little strange when you think about it. I guess my fingers were just excited! I too want a boat to hang out on a lake in! But I'll settle for your pictures. Thanks for making me want a camera too! ok, I totally had boat head all night Sunday night after fishing all day. It is the most annoying thing ever. Of course boats have radios! Ours has a CD player and everything! and- RE: Understanding Exposure- that is the book that really made it all make sense to me. The author, Bryan Peterson, also has some dvds you can get from his website that will make a HUGE difference in how you understand how the camera works and how to get a great exposure. Your first tries at freezing water, etc. are great. You will need a tripod to get that cotton candy effect, though. Girl- ANYTIME you want to talk photography, email me because you know that is my hobby. you can go to www.ppsop.com and that's the site where you can get more guides/videos from bryan peterson. He's the reason I've learned what I know now!